For me, the first thing that comes to mind when I think of Seattle – no, not Nirvana, grunge, or even good beer – is fresh seafood. Sure, it’s a bit corny that the fishmongers in Pike Place Market still put on their show for the tourists where they toss around huge salmon like a football, however it still a great place for a stroll. 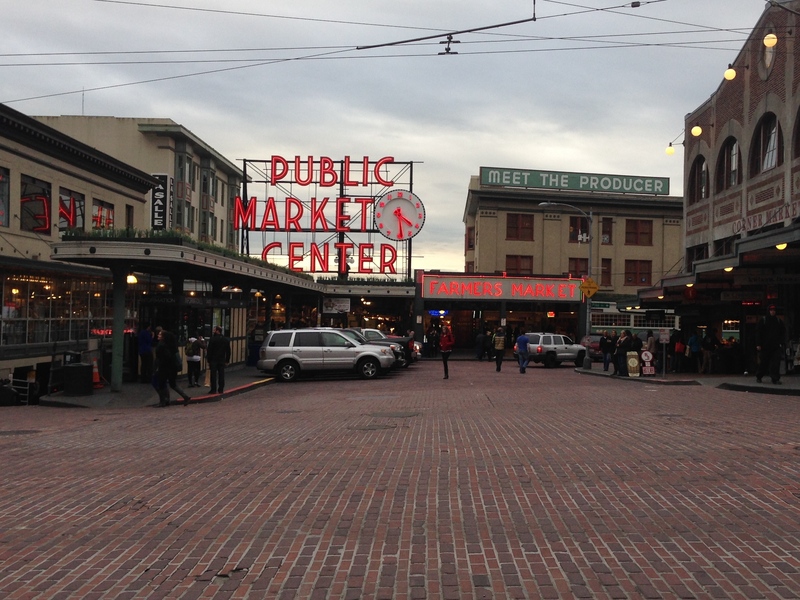 It is also a working market and you can find great deals on seasonal produce, craft items, and of course seafood in the area around Downtown Seattle. This trip, I was mostly near the Washington State Convention Center area, so I wanted to share a few spots that we enjoyed relatively close to that area. >> If you have a bit more time and inclination, I also highly recommend a trip out to Fremont for an alternative view of the Seattle skyline. If for nothing else, you MUST stop at Paseo for a sandwich, but if you have a few hours to kill, I’d recommend to make an afternoon of it. When I asked for Seattle recommendations, my Instagram friend, Mark (chef/owner at Full Moon Cafe in Hilo) recommended I try a restaurant called Toulouse Petit in Lower Queen Anne. I didn’t realize it until my last day but the restaurant was only blocks from my hotel! Luckily, a fellow AWP attendee from Hawaii, Brenda, was down to meet up there for brunch before I had to catch my train for Portland. I’m so thankful that we made it, although I wish I had time to go back for happy hour! First, their menu is enormous. 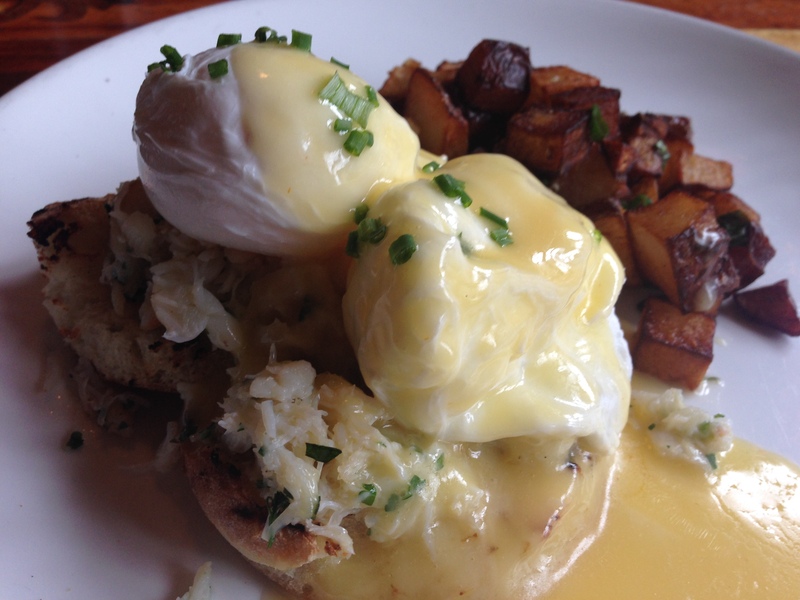 We went with the two most popular items recommended by our server – Dungeness Crab Benedict for me and Duck Confit Hash for Brenda. An Instagram post of the benedict got over 60 likes within the first three hours, and it tasted just as good (if not better) than it looked! Weekday mornings they have a breakfast happy hour where you can save $3-5 per plate on most breakfast items. Their regular happy hour boasts a small plates menu with over 50 items ranging from $4 to $8. A full bar with great food makes it a popular spot, and even at 10am there was a 20 minute wait. We had to speak a bit louder to hear each other over the lively conversations going on all around us, but overall the atmosphere was lively and fun. Highly recommended. Obviously, I’m an omnivore, but once in awhile I’m veg-curious so it was a good opportunity to head out for lunch with my friend Kim to a vegan restaurant in the Capitol Hill area to celebrate both her birthday and our time at AWP. 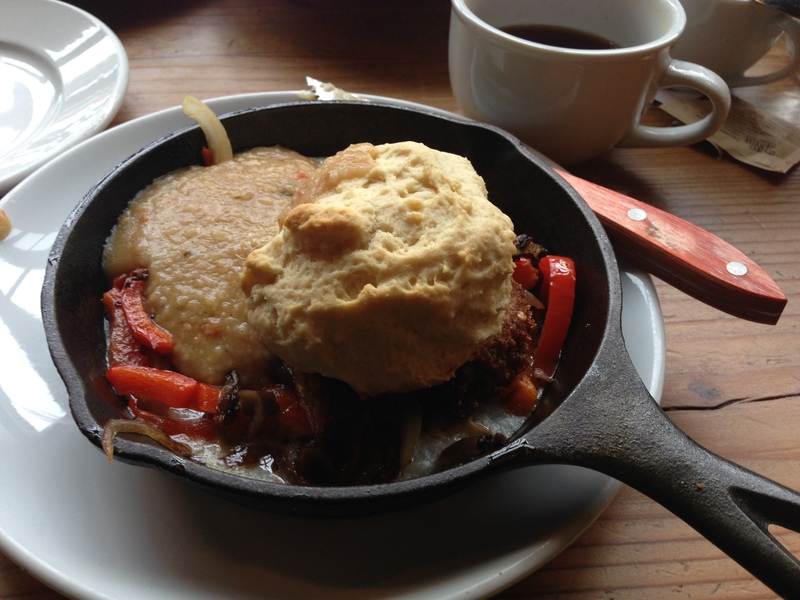 I ordered a breakfast skillet with panko-crusted seitan, umami-rich mushrooms and sweet red peppers, grits and a biscuit with mushroom gravy. Although the size was on the small side for its $16 price tag, it was hearty and flavorful and I did not miss the meat. We also split their signature “Mac n ‘Yease” which is made with nutritional yeast, which gives it a savory, almost nutty flavor (sort of reminds me of how you’d add nutmeg to mac & cheese) and a bit of spice to give it a kick. Yum! Met up with a few friends for a quick drink and a few appetizers at Lola, one of restauranteur Tom Douglas’s hip spots in Belltown. My new friend Mei-Lu who suggested it had already been here for breakfast and had to return, so she knew to order the doughnuts with house made jam (this month it’s strawberry preserves). 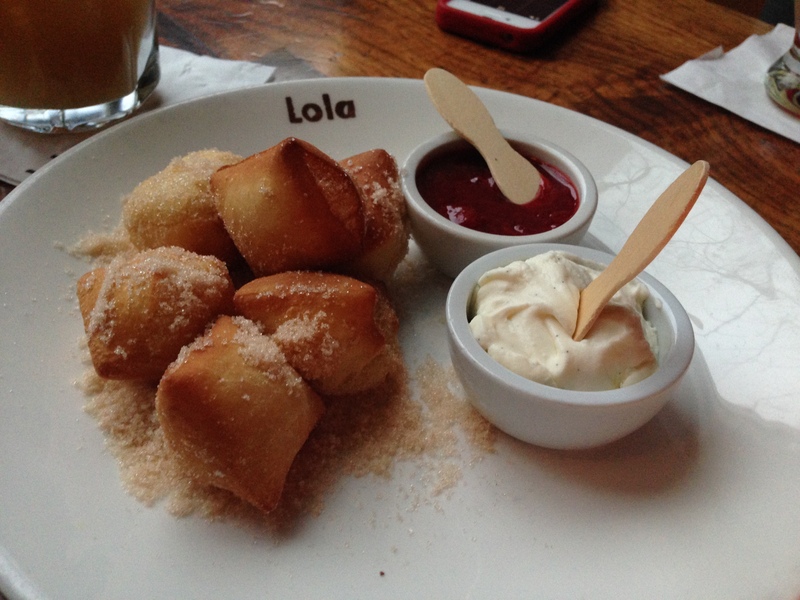 They’re served hot and rolled with sugar in a paper bag – it reminded me of malasadas! Definitely ask for these if you don’t see them on the menu. They were mentioned by Giada De Laurentiis on the Food Network Show “The Best Thing I Ever Ate” so they’re quite popular. Follow in Anthony Bourdain’s footsteps and visit this Russian Bakery in Pike Place Market. The most popular of the savory pies are the Salmon Pate Piroshky (seen above) and the beef & cheese flavors, but try the sweet ones too! 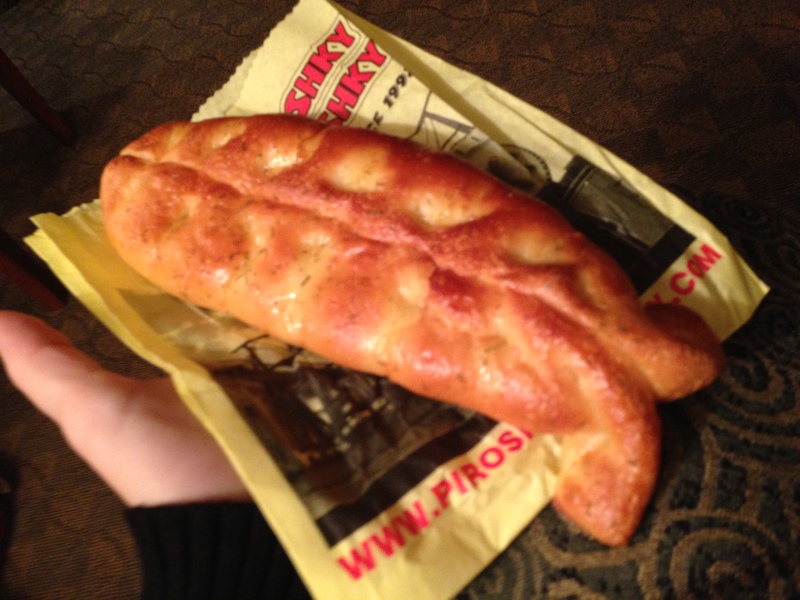 I packed the rhubarb piroshky for my Amtrak ride to Portland, and it was a great portable snack! The first day of the AWP Annual Conference was almost overwhelming because there were so many great sessions to choose from, as well as a huge book fair. By lunch, my stomach was growling and I skipped out on a session to make a trek down to nearby Pike Place Market to satisfy my chowder craving. 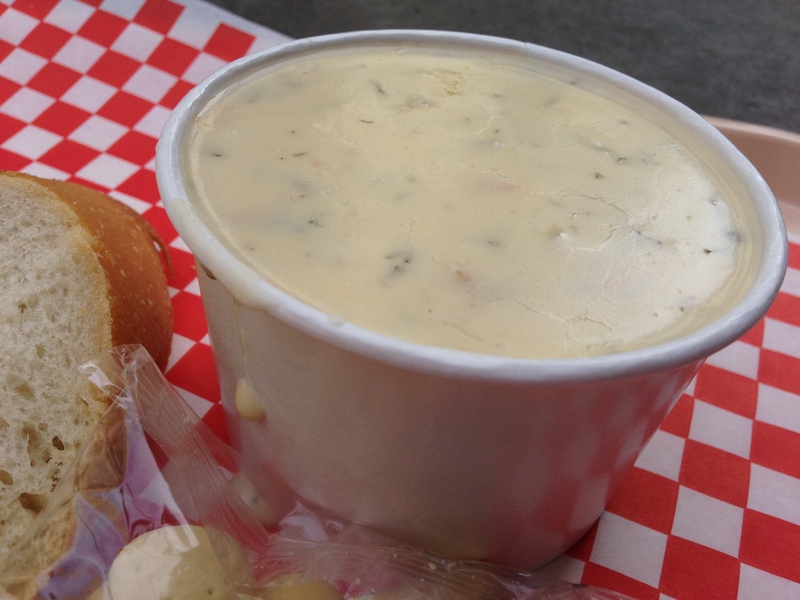 I’ve tried four or five flavors and never been disappointed, but today I opted for the seared scallop chowder. YUM. >> The last two I found on a previous trip to Seattle when I signed up for a tour of Pike Place Market with Savor Seattle Tours, which I’d highly recommend. Well worth the money and full of interesting foodie tidbits to go with your samples. Do it on your first or second day in town, if possible, as they also provide a discount card for many of the tour stops as well as other popular spots around town. >> Still hungry for more? Check out my ongoing list of Seattle recommendations.